twice as a player and coach. where he lived a quiet life. brother, the Governor of Delta State, Dr.
mark in the sands of time. to confirm if it was true. a big loss to the country. happy with the legacy he left behind. However, it’s a great loss to the country. I send my sympathy to the family. verge of landing a job in South Africa. His death is terrifying and very sad. soul rest in peace, Amen. mentor, and he always put me through. in pains and I can’t hold back tears. believe he is no more. pray God grant him eternal rest. This is a big loss to Nigeria football. Nigeria football and Nigeria as a whole. (NFF) for this great loss of a legend. expected, but who are we to query God? He is the omnipotent, and omnipresent. fortitude to bear the loss. also successful. It’s most unfortunate. December last year and now he is gone. on and off the football pitch. Lagos State governor on sports. his soul a perfect rest. 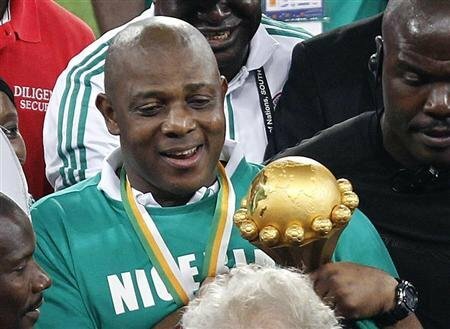 So sad that we lost Keshi at this time. the fortitude to bear this huge loss. pitch. We will never forget him. US. This is shocking and unbelievable.